In 1914, the Daily Picayune and the Times-Democrat newspapers merged and published both banners across the tops of pages. Ashton Phelps took the reigns as president of what would become The Times-Picayune. 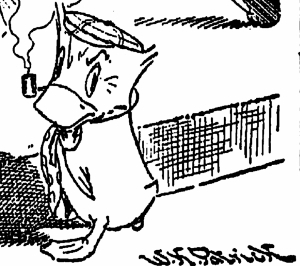 The Times-Democrat's duck mascot (left), by political cartoonist W. K. Patrick appeared on the front page on April 6, 1914, taking the place of the Picayune's frog mascot, which first appeared twenty years earlier, on January 13, 1894, in the Daily Picayune after owner Eliza Jane Poitevent Holbrook Nicholson commissioned staff cartoonist Louis A. Winterhalder to illustrate the Weather Prophet. 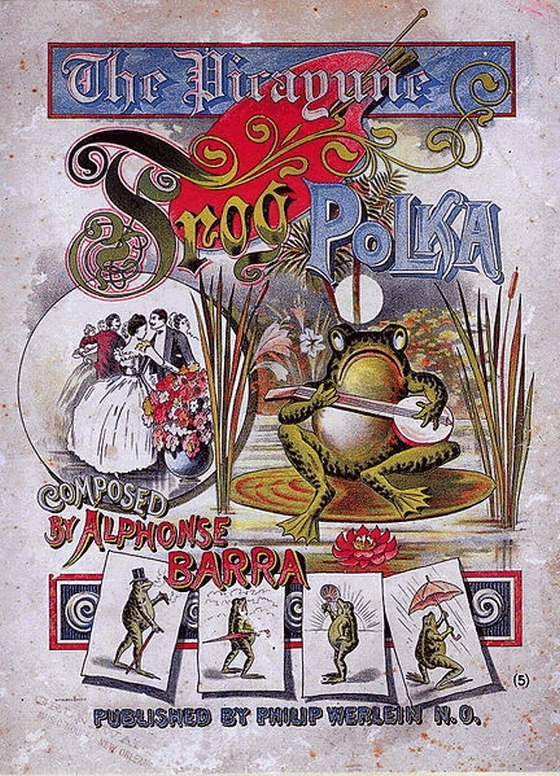 The frog was so popular that Alphonse Barra composed the "Picayune Frog Polka," which was published by Philip Werlein in 1894. A view of the sheet music cover, which was illustrated in a chromolithograph by M. F. Dunn & Bros. of New Orleans, appears on the right. During the 1900s Profit the frog appeared as the ringmaster of the Frog Circus on the children’s page; Frog Circus illustrations were later bound into a book for children. The frog's image was also inlaid on spoons, which were hot selling items back in the day -- the photo below is from the Times-Picayune. The frog first failed to appear on December 27, 1914, eight months after two papers merged. Patrick's character, known only as "the duck" spewed witticisms and comments regarding happenings of the day -- always appearing near his signature. The duck's popularity inspired toymaker John Whiting to create a mechanical version, sold in the store he owned with Julian F. Benjamin known as Kitty Corner Toy Works at Toulouse and Bourbon street. Patrick left the newspaper in 1919 to take a position at the Fort Worth Star Telegraph -- and he took his duck with him. Patrick drew for the Fort Worth paper until his death in 1936. The Picayune's frog was revived after Patrick's departure from New Orleans. As often happens in the lives of middle-aged employees, the 58 year-old frog was replaced by 11 year-old upstart Pogo the Possum, Walt Kelly’s syndicated comic strip character. in 1952. 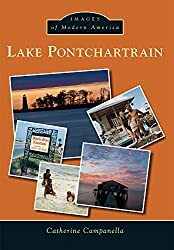 New Orleanians expressed their outrage that this out-a-towner was allowed to usurp our homegrown mascot. The paper responded with a week-long contest which pitted Pogo against the frog. Both appeared side-by-side for seven days while readers decided which one they favored. The April 8, 1952 front page proclaimed "Frog Wins 'Weather Derby,' Despite Pogo's Late Rally." The frog had received 5,170 votes. Pogo trailed with 4,087 . The poor old frog went missing again, at the age of 88, on March 29, 1982. But in 1995 old drawings, predominantly by staff artist Louis Benedic Sr., were digitized, colorized, and reprinted. Benedic had retired in 1976. On February 2011 the frog first appeared on-line at nola.com. Now over a century old, the frog still graces the pages of the Picayune. He still looks great. The first baseball game in the Superdome was an exhibition between the Minnesota Twins and the Houston Astros on April 6, 1976. The American Association New Orleans Pelicans played at the Superdome during the 1977 season with an attendance of 217,957 at the dome. On April 6, 1893, Andy Bowen and Jack Burke fought 110 rounds to a draw in New Orleans in the longest prizefight in history. The fight lasted seven hours, 19 minutes.